With a graceful tone to match his existing body of work, director Jean Becker unveils his latest, My Afternoons with Marguerite (2010), a charming and serene film that explores an indispensable relationship between two unlikely French citizens. Gérard Depardieu stars as Germain, an unprivileged, illiterate handyman who spends his days defacing public monuments and counting pigeons in the park, where he regularly meets ninety-five year old Margeuritte (Gisèle Casadesus). The two spend their sporadic liaisons reciting French literature and swapping stories from their diverse pasts, all the while recognising a mutual appreciation for one another. Theirs is a relationship built upon classic foundations; she is wise and optimistic whereas he is oafish and negative, suffering from a cruel lifelong oppression at the hands of his increasingly senile mother, a plot element I felt could have been explored further despite the amusing flashbacks. Acting as an accessible maternal figure, Casadesus brings a fragile tenderness to her role, filling the screen with an uplifting likeability that I couldn’t help but warm to. She and Depardieu share a tender chemistry and bounce off each other with pleasant aplomb. This film is a triumph in many ways. Imitating a few elements from Driving Miss Daisy (1989) and sidestepping creepy undertones found in films like Harold & Maude (1971), Becker adapts a tender, melancholic story that ends on a feel good high. 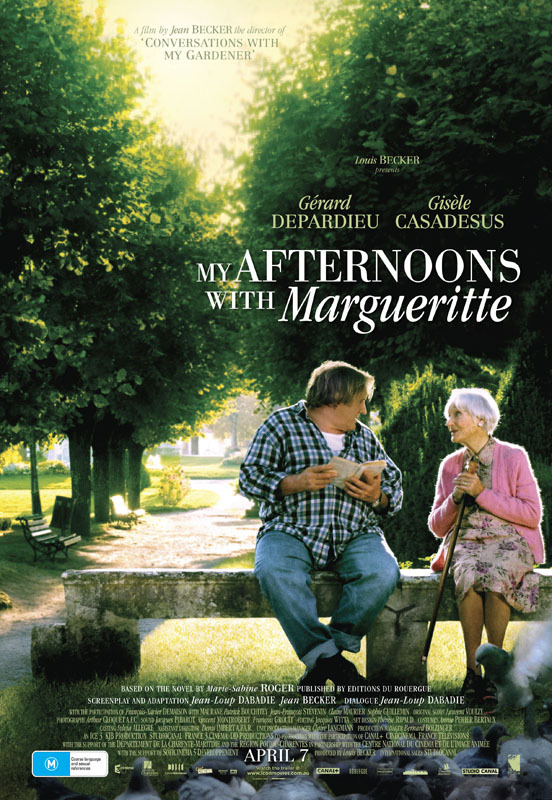 Unspoilt by the heart-warming affection between the two protagonists and benefiting from a transient theme, Afternoons with Marguerite features an amicable geriatric relationship, proving ultimately more refreshing given its rarity in modern day cinema.